From potty training to socializing, there are a lot of adjustments to be made when you adopt a puppy. But among all of these responsibilities, none is more important than taking your new pet to a trusted veterinarian within a few days of adoption. Through an initial pet health exam, your vet will identify and resolve any existing medical problems—and provide a variety of services to help your dog lead a long and healthy life. If you’re preparing for this critical check-up, here are a few activities you can expect to take place during the appointment. After you check in, veterinary staff will conduct quick and simple tests to get a reading of your pup’s weight and temperature to make sure they are at normal levels. Additionally, your vet will use a stethoscope to assess your pet’s heart and lung function. Your veterinarian will also conduct a full physical inspection of the dog’s body to check for a variety of pet health problems. During this part of the examination, the specialist will inspect the eyes, ears, mouth, feet, and reproductive organs. The skin and coat will also be evaluated to see if flea treatment is necessary. 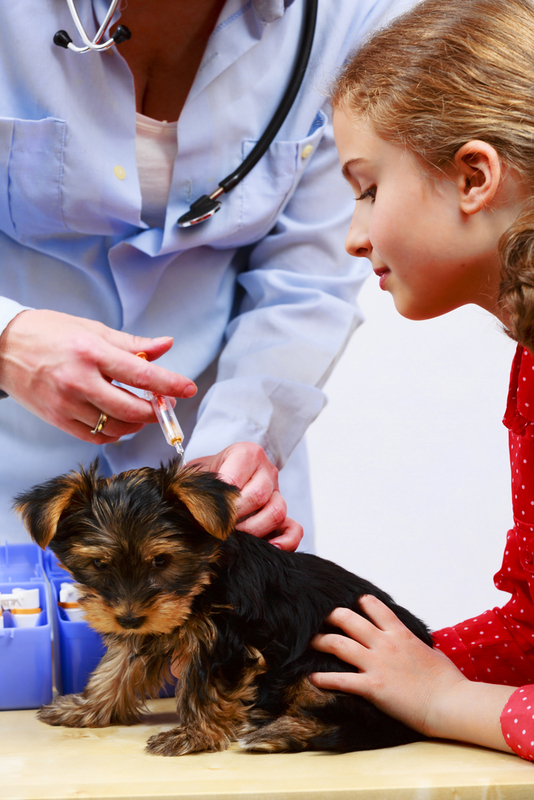 Depending on your puppy’s age, pet vaccines may be necessary. Immunizations are given periodically to help prevent your dog from developing diseases that, in some cases, can be fatal. Be sure to follow-up with your vet to find out when future vaccinations should be delivered. Your pet health provider may ask you to bring in a stool sample or collect one during the appointment. This sample will be tested for worms, which are common in younger dogs. If parasites are present, de-worming will be provided. Puppies have specific nutritional needs to support their rapidly growing bodies. As such, you should discuss what pet foods are recommended for your dog and how often feeding should take place. When you want to start your puppy off on the right paw, visiting a trusted veterinarian can make all the difference. If you’re looking for high-quality pet health care in Clarksville, AL, turn to the experienced team at Parker Animal Clinic. Serving the River Valley community for nearly two decades, this animal hospital is equipped with all the resources to optimize your companion’s health at every stage of life. To learn more about their services, visit this veterinary clinic online. For appointments, call a friendly staff member at (479) 754-5656.